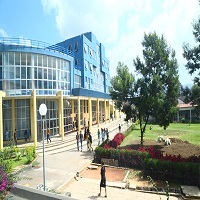 The AAiT (Formerly the College of Engineering) was established in 1953 by the Ministry of Education of Ethiopia, and was housed in a set of building in the compound of Technical School of Addis Ababa. Initially, only a two year program of Intermediate Engineering studies was offered and students were subsequently sent abroad for the completion of the student leading to a Bachelor of Science degree (B.Sc). At this time, the Library was holding about 9,000 volumes and over 300 titles in Periodicals. And now the library possesses about 30, 000 volumes of books. Addis Ababa Institute of Technology (AAiT) Library system which is a leading engineering Information Center in the country which has large number of users has been providing services to the Institute Community, Scholars and Professionals in engineering and related fields of studies. The AAiT Library plays an important role in supporting the Institute Mission of excellence through teaching and research by making information resources easily, timely and efficiently accessible to all its potential users. For such purposes, building strong libraries for teaching and research is necessary for any academic institution. The AAiT library provides the vital core services by facilitating and improving the teaching and learning process of the Institute. As the "heart of the Institute", the AAiT library dutifully supports all students to tap the resources when searching for new knowledge and to clarify or to strengthen the knowledge they already possess. The dynamic and complex library and information services require up-to-date and uninterrupted attention to ensure services of the highest quality with abundant access to relevant literature in both print and electronic formats with a qualified staff because libraries must be the core of university teaching, learning and research. Student’s enrolment has increased dramatically considering the 70/30 enrolment ratio and the budget and Human Resources allocations have not much proportional. The library have many challenges, Automation and basic technological adaptation are by far needs more attentions. Longer steps and duplication of works are series bottle necks for the efficient service addressing of the library. Shortage of proper number of employee including professional librarians in regarding the size of the services and the library contain in balance approach and clear dissatisfaction and complaints of the end users. The Institute Library shall be headed by a Head, Librarian. The Institute Librarian shall have an overall responsibility for the well functioning and development of the Library system. The AAiT library has structured by both academic and administrative support staff. The AAiT Library shall have two divisions: Technical and Public Services Division. The technical and public service divisions have different sections. Such as Acquisitions (Books Selection, Ordering and Receiving based on the list sent) and receiving cataloged materials and send books to Central Cataloging Department to be cataloged. .Identifies and selects library materials/collections to be digitized. This Division has an overall responsibility for development and implementation of information services to users of the Library in co-operation with concerned Work Units and Services. It has also a general responsibility for coordinating users’ instructions and identifying training needs of the staff and for arranging the same when approved. The Division also handles external relation and publicity of the Library system. .Work with each school members to place materials on reserve. Periodical Service is responsible for handling a variety of serial materials in the library including document delivery, request photocopying, serial repairs and binding service. The Service is also responsible for keeping periodical files up to date and managing serial collection in the library. It also coordinates serial selection, subscription and renewal activities. Academic and research libraries have been investing in information technology (IT) for more than twenty-five years, beginning with the automation of repetitive processes such as cataloging and circulation. The initial goals of automating these functions were to reduce the rate of cost inflation, if not the absolute costs, of these operations and to improve the timeliness and accuracy of information. Over time, automation also enhanced direct services to users. The online catalog, with its twenty-four-hour-per-day availability, sophisticated search-and-retrieval capabilities, and ability to provide information not included in card catalogs, is the prime example of the corollary benefits that our library users experienced. Today, library automation is mature, and the rapidly growing availability of digital information -- including indexing and abstracting services, scholarly journals, popular publications, quantitative data, and digital copies of materials originally issued in print -- promises to transform library services and the experience of library users. .Libraries are being transformed not only by external pressures and opportunities but also by internal developments and demands, specifically the creation of digital information and services. As the twenty-first century dawns, campuses face limitless opportunities to invest in IT but have finite budgets. Moreover, competition for institutional resources is intense. Thus, the choices to be made are crucial. How can the campus ensure that scarce resources are invested wisely? How can it demonstrate the value that library IT investments add to teaching and research? How might planning for future IT investments in libraries build on the assessment of past successes and failures, and how can rigorous outcome measurements for future investments be developed? .3, The Library have downloaded more than 300 Journal Articles, we will give it to the users on request and send through e-mail the downloading process will continue. Please enjoy with the vast amount of electronic resources of the library.